HIGH POINT — The state employee who led a 2017 survey of Cedarbrook Residential Center, a McDowell County assisted living facility, testified in a Guilford County courtroom on Wednesday that the investigation was lengthier and more expansive than usual because of numerous “red flags” he and his team saw during their time at the site. Harold Davis, a pharmacist and recently retired state surveyor with the Adult Care Licensure Section within the Department of Health and Human Services Division of Health Service Regulation, testified before Administrative Law Judge Randall May that the state survey team was at Cedarbrook in late September and early October for an annual inspection and to investigate complaints that the state had received regarding the facility. For example, while at the facility for the inspection, alongside employees of the McDowell County Department of Social Services, Davis said he witnessed an insulin administration that appeared problematic and that when he checked through Cedarbrook’s records he found that several residents weren’t receiving their medications in accordance with doctor’s orders. That allegation led to one of several violations for which Cedarbrook was cited in the DHHS statement of deficiencies for the facility. That document, which also included additional allegations about improper supervision of residents, violations of resident rights, filthy living conditions and inadequate staffing, led to state regulators imposing a suspension of admissions at the facility. May granted a temporary restraining order in November that lifted the admissions ban, paving the way for the Guilford County hearing, which continued on Thursday and Friday. Attorneys for Cedarbrook have asked May to grant a stay in the case that would lift the suspension of admissions permanently. Lawyers for Cedarbrook argued on Tuesday that state surveyors were targeting their client in an “arbitrary and capricious” manner and that the 2017 statement of deficiencies was a series of mischaracterizations and untruths. Derek Hunter, an assistant attorney general for the state Department of Justice, argued Wednesday on behalf of DHHS that state surveyors would have no reason to fabricate the findings that were published in the statement of deficiencies. He told the court that none of the surveyors stood to gain financially by cracking down on Cedarbrook, and that any funds generated by penalties levied against the facility and its owner, Frederic Leonard, would be paid to the McDowell County Schools system, rather than flowing back into DHHS coffers. Hunter also argued that the suspension of admissions was put in place as a “slow down until deficient practices are brought into compliance.” Attorneys for Cedarbrook had previously argued that the state’s end goal is to shut the facility down completely. Hunter countered that the state had several mechanisms it could have used to close the facility immediately, if that action had been warranted. 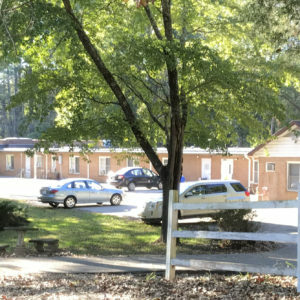 Cedarbrook was the subject of a previous Carolina Public Press investigation that detailed how the state settled a prior lawsuit with the facility’s owner and removed more than $350,000 in penalties, erased a zero-star rating and wiped a nearly 250-page statement of deficiencies from the DHSR website. That case, which began with a scathing survey in 2015, included many of the same allegations that investigators have levied against the facility more recently.